Three little words for you today. I love Etsy. Etsy is like Pinterest, highly addictive and I can spend hours on it. I typically browse for art work, DIY supplies (such as fun rhinestones and findings), and I love finding one of a kind gifts for special occasions. Being an advocate for handmade goods, I really enjoy supporting local crafters and businesses, it feels like every piece has its own tale. 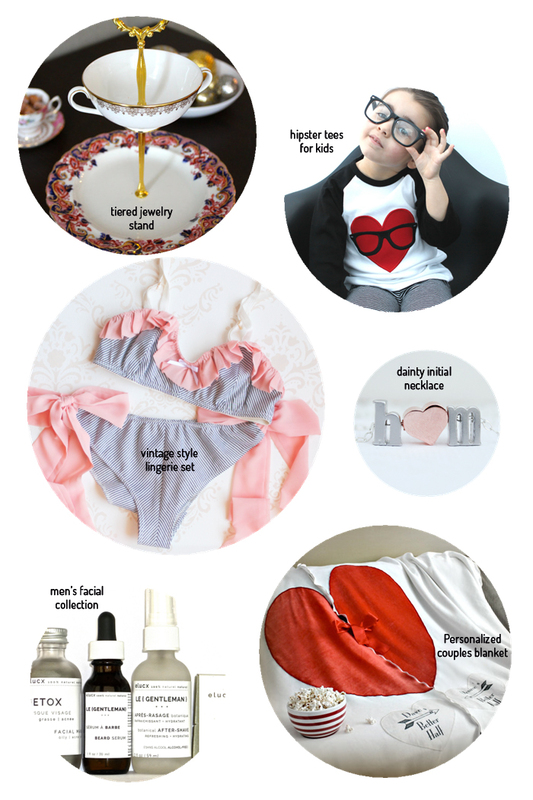 I came across some super cute gift ideas from Etsy and curated a Valentine’s Handmade Gift Guide for you to consider. How SUPER adorable is the hipster tee on the little girl and what about the personalized couple’s blanket?! The blanket is just perfect for snuggling up on the couch with your special someone.